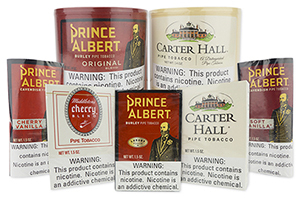 Milan Tobacconists offers a wide selection of fine pipe tobacco for the discerning smoker at reasonable prices. Only our most popular brands, such as Balkan Sobranie, Borkum Riff, CAO, Dan Tobacco, Davidoff, Esoterica, Mac Baren, Middleton, Peterson, and Erik Stokkebye pipe tobaccos, are listed here. If you are unable to easily locate a particular tobacco pipe tobacco, please give us a call at 877.70MILAN or send an email to customercare@milantobacco.com. We'll do our best to make a match! Erik Stokkebye is the 4th generation tobacconist from a stellar lineage steeped in tobacco tradition. Erik pays tribute to the Stokkebye heritage with the creation of 5 blends, 4 of which are named after each of the Stokkebye patriarch's birth year and reflecting their unique personalities and blend preferences. Balkan Sasieni Original Formula Pipe Tobacco Mixture was created by London's Master of Tobacco Blenders decades ago with the choicest Macedonia and Latakia leaf and rich Virginias and is blended today by Scandinavian Tobacco Group in Denmark. The Balkan Sobranie Original Smoking Mixture pipe tobacco is a reintroduction of the legendary original recipe made famous by the House of Sobranie. Originally blended by J. & F. Bell, Three Nuns Green is now made by Mac Baren Tobacco Company in Denmark according to English tradition. The name Borkum Riff was once only associated with the lightship 'Borkum Riff' that had a lighthouse onboard and sailed the North Sea off the Dutch coast showing other ships the way. 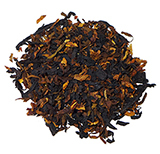 Since Borkum Riff pipe tobacco was introduced in 1962, however, it quickly surpassed its namesake in notoriety. 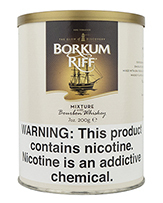 "Mixture with Bourbon Whiskey" pipe tobacco is among the most popular blends offered by Borkum Riff. CAO has taken the amazing flavors contained in their best-selling Flavours by CAO cigars and made them available for pipe smokers using premium pipe tobaccos. 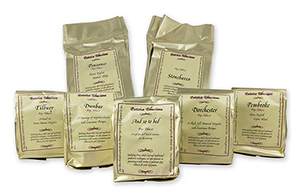 Dan Tobacco of Germany brings to the U.S. some of the finest pipe tobacco blends in the world. As with Davidoff's premium cigars, the luxury brand's tinned pipe tobaccos are curated for the ultimate in sophisticated smoking enjoyment. These specially selected and expertly blended high grade tobaccos create classically traditional mixtures with invitingly elegant flavors and aromas. 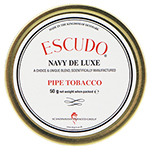 Various incarnations of Escudo Navy De Luxe pipe tobacco have been available since 1912, with this most recent reintroduction to the US market in 2006 by Scandinavian Tobacco Group of Denmark. Entirely made, blended, and aged in the UK British Isles, Esoterica pipe tobaccos are considered among the finest blends in the world. J.F. Germain & Son began manufacturing tobacco in 1820 under ideal climatic conditions on the island of Jersey in the British Isles and has played an important economic role there for more than 180 years with its remarkably successful, multi-generational family business. Milan Tobacconists offers a variety of the Middleton company's pipe tobaccos and tobacco cigars. Choose from over 50 exclusive Milan Tobacconists pipe tobaccos representing the high-grade aromatic, non-aromatic, English, and Turkish blends most often requested by our customers all over the world. L. Orlik Ltd. was founded as a pipe manufacturer in 1899 by Louis Orlik in London, England. The company used the slogan "Smoked by All Shrewd Judges" along with the image of a judge smoking an Orlik pipe in its marketing material, both of which are still displayed today on Orlik's tins of high grade pipe tobacco made in Denmark. Peterson pipe tobaccos are hand-blended by Peterson of Dublin's master blenders. Henry Sutliff opened his first tobacco shop in 1849 and this delightful, non-aromatic blend commemorates that auspicious year.